Treadmill-get the best out of yours! I’ve got great treadmills for sale. If you’re buying a new treadmill but don’t know what to look for, I’ve selected some great treadmills for sale. I have a small range of treadmills for sale to suit almost everyone. All the treadmills have the highest quality treadmill parts and technical back up and come with full factory treadmill warranties. I deliver and assemble all new treadmills in the Auckland area. This eliminates any stress and assembly issues. I’ll show you how to get the best value for money by buying the right treadmill for you. I’ll show you how to use your new treadmill and how to look after it. In fact, it’s my aim to eliminate all the challenges of having the right treadmill in your home. So on top of delivering and assembling your new treadmill, I’ll remove your old treadmill too. So all you need to do is enjoy your new treadmill and get the most out of your investment. I’ve selected treadmills for sale to suit everyone. From walking to keep fit and toned to people wanting to train for a marathon or sporting event. I’ve got treadmills to suit everyone’s weight range. And treadmills that are suitable for sports clubs, small to medium gyms or hotel gyms and apartment gyms. 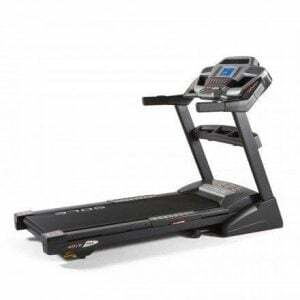 The first treadmills for sale I have to show you is the Sole F63. It’s well designed, strong and durable. I recommend this treadmill to about 80% of home users that weigh 100 kg or less. I know this treadmill can take a lot more weight. But the key to getting value for money is to buy a treadmill that’s not working to its full potential. The Sole F63 treadmill has a large 3hp continuous duty motor that will effortlessly give you a smooth run. It has a large running surface, with ample room for any running style. Which makes the Sole F63 suitable for all runners, even if you’re over six feet tall. It has a beautiful console display that now has Bluetooth. You can download a phone app that tracks your workout and progress. You can also choose between 6 customizable programs and 2 heart rate programs. Or you can simply hit the start button and use it in the manual mode. The Sole F63 Treadmill folds up safely and securely with gas struts making it easy. Lowering the Sole F63 Treadmill is just as simple with the gas struts taking the weight and slowly lowering the treadmill base to the floor. Folding up the treadmill gives you more room when you’re not using your treadmill. The Sole F63 has great a suspension system which cushions your joints and protects your body from jarring up to 40%. This helps your body stay in top shape and reduces the risk of injury immensely. Not many treadmills for sale at this price point offer this level of cushioning. Let’s talk about the treadmill warranty. You know it has a lifetime frame warranty. Well, all the electronics have a 3-year warranty, this includes the treadmill motor. The treadmill running deck also has a 3-year warranty subject to lubricating between the treadmill running belt and deck every 1 to 3 months. The Sole F63 treadmill has a 1-year labour warranty. Not many treadmills for sale in New Zealand offer this high level of treadmill warranty. I will deliver and assemble the Sole F63 treadmill for $2,695. Normal retail for this treadmill is $2,995 plus delivery and assembly. I will also take away your old treadmill and recycle it for you. You can connect your iPod, mp3 player or Bluetooth your phone to have music coming out through the speakers. It has large front and rear rollers for increased running belt grip and lower rotational speeds for increased roller bearing life. The console also has Sole’s message board which shows you how to use the features like how to set up a user profile. The running belt alone is over half a metre wide and over 3.2 metres long giving a running surface of half a metre wide by 1.5 metres long. 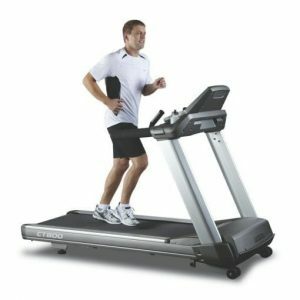 The Spirit CT800 treadmill has a large running belt and deck. The running surface is 560mm wide by 1520mm long. So much room to run no matter what your height is! The belts last for about 4000 km’s and are lubrication free. The decks have a hard wax surface which needs to be flipped after a year or 3 depending on the environment the treadmill is in. The Spirit Ct800 treadmill has a large 3 horsepower continuous ac drive motor with H insulation(higher operating temp capability). The AC drive motor is more efficient than dc motors and requires less maintenance. 95% of all high-end commercial treadmills for sale in New Zealand have AC drive motors. The frame on the Spirit CT800 is Heavy-Gauge High-Strength Steel with Durable Powder-Coat Paint. This treadmill weighs 160 kg so you know it’s built tuff. Another feature of this treadmill is the aluminium uprights that support the console. The side rails are also aluminium which is a great feature because plastic side rails crack and break over time. This is a very solid treadmill an is genuinely a commercial treadmill. The frame comes with a lifetime warranty that covers broken welds and breaks. Only special treadmills offer this warranty. Another great feature of this treadmill is the heavy duty 75mm diameter front and rear rollers. This may not sound interesting but it gives the treadmills running belt more area to grip on which in turn reduces the overall tension needed on the running belt. This helps reduce the stress on the electronics and reduces the stress on the roller bearings. Another advantage is the increased roller diameter reduces the roller rotation speed at any given set speed. This simple design feature reduces maintenance and prolongs treadmill reliability. We are very happy to have discovered Robert. When our last treadmill was on its last legs he kept it going for a decent interval then gave us superb advice and service in purchasing a new one. The new treadmill is terrific – smooth and well cushioned, and destined to be just as well loved and well used as the old one. Robert has been excellent both in terms of customer service and technical advice and assistance. We cannot recommend him more highly! “I found Robert’s company online following some damage I inflicted on the running board of my treadmill.Robert came round to our house, had a good look over the treadmill and gave me a number of cost-effective options which saved me from having to buy a completely new unit. Robert gave really good advice and tips on how to look after a treadmill for the long haul and was very reasonably priced. Robert has been an amazing help with my two treadmill purchases in the last five years. He is easy to contact, prompt and efficient. He knows his stuff and I would highly recommend you get in contact with him before purchasing or for any queries on an already purchased treadmill. I run 35 – 40Km / week and was needing something to keep up with me. Robert definitely pointed me in the right direction for purchase and was thereafter purchase to facilitate a warranty transfer. Highly recommended.